For some strange reason, I have never been big into the taco salads. Perhaps the idea of eating greasy hamburger in a salad isn't very appealing. Don't get me wrong, I love me some taco meat, but in a taco. All I can imagine is the lettuce getting wilted, warm and greasy. But maybe that's what makes them so appealing? I don't know. A few weeks ago, I had an "aha!" moment. Why not use seasoned chicken in place of the hamburger! I know that I am way behind on the taco salad wagon. But, when I menu planned, I was SO excited to make taco salad. I de-boned a couple of chicken breasts that I have stored in our freezer, seasoned them, and cooked them up. The chicken mixed in with loads of veggies, served with corn chips, was the perfect meal in my books. It was exactly what I was looking for. I mixed up a little tomato and lime dressing to drizzle over. Delicious! I couldn't wait to have it again for lunch the next day. The chicken makes this meal that much healthier. But, if you want even healthier, bake the chicken instead of pan frying. Season each side of the chicken breasts with the all spices and salt and pepper (I just do a healthy sprinkling of each). In a large pan over medium-high heat, melt the butter in the oil. Once the butter is melted, place the chicken breasts in the pan. Cook the chicken until golden brown on both sides and completely cooked through, about 8-10 minutes per side. If the chicken starts to burn, turn the heat down and cover. Place the chicken on a cutting board and let cool slightly before dicing. To make the dressing, place all of the ingredients in a food processor. Process until smooth. Pour the dressing into a small pitcher or jar, cover, and place in the refrigerator until ready to use. 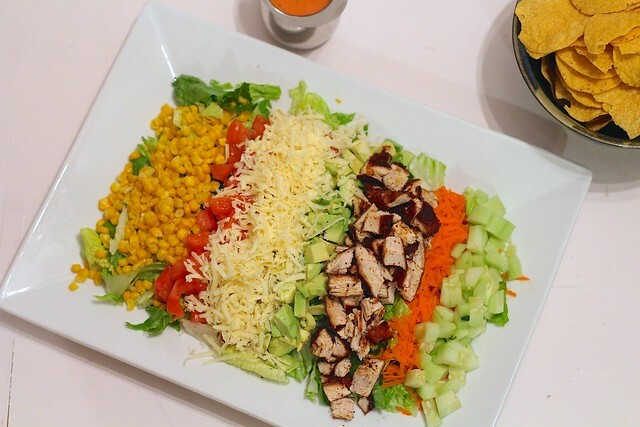 To assemble the salad, spread the chopped lettuce on a large platter or bowl. Gently mix in the corn, tomato, avocado, carrots, cucumber, and diced chicken. Sprinkle the shredded cheese over the top. Scoop the salad into individual bowls. Crush chips over the salad and drizzle dressing over the top. Serve.